So far, so good when it comes to the Green Rush. One: People are smoking weed more openly than ever — even in California. Two: High-end retailers are now marketing getting high as “wellness,” meaning it’s becoming increasingly guilt-free to be a stoner. So as I hit my Dream Queen pre-rolls from MedMen and rub my temples with CBD cream, I feel pretty good about myself (which probably has something to do with Dream Queen’s reputation to produce euphoria). It immediately inspired my greatest weed-related panic: Will all my puff-puff-passing lead to pulmonary problems? The easy answer is… Duh! Smoking is bad, I know. Common sense alone makes it pretty clear that funneling hot smoke — the residue of burnt plants — down one’s throat, especially via a butane lighter, isn’t exactly gentle on the lungs. And I’m well aware of the increase in my own phlegm production after facing a blunt. Yet in terms of clinical studies, smoking marijuana hasn’t actually proven to be as carcinogenic as smoking cigarettes, despite the similarities in the chemical makeups of cannabis and tobacco. In fact, researchers have straight-up found that smoking weed doesn’t give you lung cancer. So weed doesn’t give you lung cancer? Even though you typically hold the smoke in longer than you do cigarette smoke? In terms of marijuana, there’s no apparent carcinogenic effect on the lung or upper airway and no apparent effect with regard to the risk of developing chronic obstructive pulmonary disease (COPD). COPD is a chronic lung disease that’s the third leading cause of death in the U.S. Smoking is the most important risk factor for developing COPD, but marijuana doesn’t appear to increase the risk for COPD. The major site of pathology in COPD is in the small airways, which marijuana appears to have little effect on. You’re right, though: Marijuana smokers hold their breath during smoking over four times as long as tobacco smokers, leading to an increase in particulate deposition in the lung. And since the smoke particles from marijuana contain a number of the toxic components, including carcinogens, that have raised concerns about an increased risk for tobacco-related complications, including COPD and lung cancer. 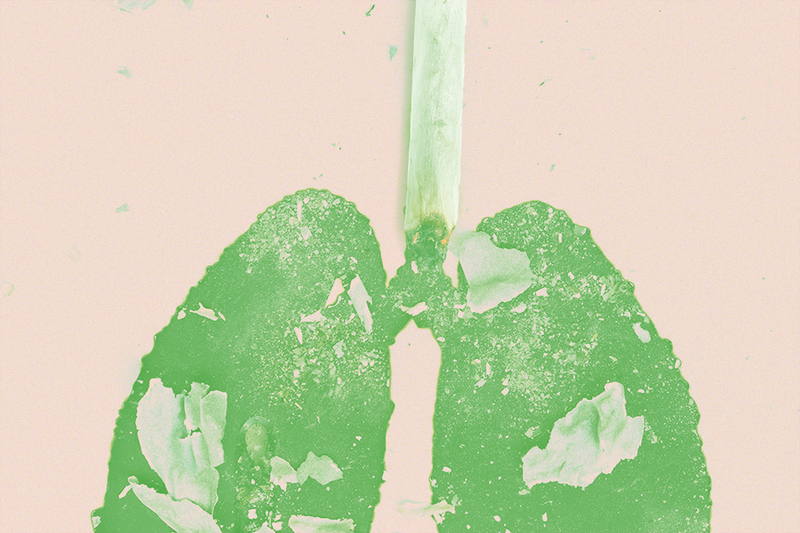 That’s why we’ve pursued these studies further — to evaluate the possibility that long-term heavy smoking of marijuana might injure the lungs and increase the risk for the development of both COPD and lung cancer. But despite this concern, we’ve been unable to show any relationship between marijuana smoking and the type of lung-function impairment that one would see in COPD. Nor did we find any increased risk of lung cancer, even among heavy smokers of marijuana, after controlling for concomitant tobacco smoking. And this was in the largest controlled case study ever conducted that looked at the possible relationship between marijuana use and lung cancer. The THC in marijuana binds to cannabinoid-type 1 receptors that are expressed on the vagal nerve endings in the lungs. And when these receptors are bound by THC, the THC inhibits the release of a chemical that’s responsible for bronchoconstriction called acetylcholine. It’s a very comparable process to what happens with use of the medicines that are currently available for prescription to treat bronchospastic diseases right now. However, I don’t believe that marijuana should be smoked for its bronchodilator properties since the smoke contains additional substances that are potentially toxic to lung tissue. What about my smoker’s cough? One of the negative consequences of smoking marijuana is that it does increase the risk of developing chronic bronchitis. That’s a chronic cough and phlegm production, which isn’t the same as COPD. We see similar changes in the bronchial tissue to the changes that we see with tobacco smoking in the larger airways, which may lead to increased mucus production and cough. It’s sort of a moot point since we didn’t show any causation between smoking marijuana and lung cancer or COPD. That said, vaping does reduce the yield of particulates in the lungs, so I imagine that people who vape would be less susceptible to chronic bronchitis than smokers, but this hasn’t been studied. Is there anything I can do to trudge up the gunk already in my lungs? Unfortunately, no. Physical activity is the most important predictor of survival, so it’s very good for general health, but it doesn’t improve lung function. What do you think about weed being rebranded as a wellness product? I don’t think it’s a health-and-wellness product. It’s a recreational drug, and patients develop some satisfaction from it. I don’t think that it necessarily improves their general health and well-being. On the other hand, there are some legitimate therapeutic applications such as the relief of neuropathic pain.